The following is list of the most popular beaches on the island. Myrtos beach is said to be the most photographed beach in Greece. One of the most beautiful beaches in Greece. A sweep of soft golden sands and amazing turquoise coloured water. Approached by a steep winding road. Featured in the film Captain Corelli's mandolin. Nearest village Divarata. 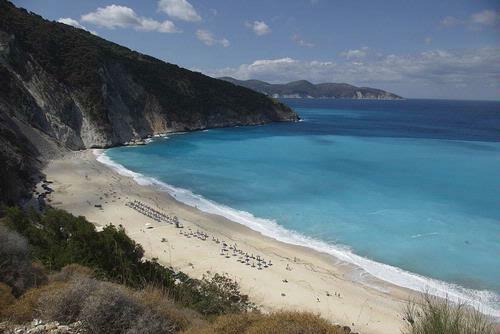 During the summer months, the Municipality of Pylaros provide a regular bus service to and from Myrtos Beach. Timetables are posted outside the Tourist Information office in Agia Efima. The bus leaves from the harbour area. On the east coast near Sami. A horseshoe shaped bay backed by lush green hills. Attractive white shingle beach. Clear turquoise water. A Blue Flag beach. A long sandy beach with rocks at either end. Backed by pine woods. Great for kids. One of the beaches at Lassi. Another Lassi beach. Very busy. White soft sands and clear water with plenty of rocks dotted around the bay. Worth visiting. Near Fiskado. A popular beach just north of town. Small beach with white pebbles. Near Fiskado. A short drive east of Fiskado brings you to this popular beach. Nearest village Lourdata. A quite busy beach as there are a few hotels nearby. A thin strip of whitish sand is found below the sea wall. Close to airport. Orange coloured sand. The beach shelves gently into the clear water. Near airport, this beach has stretch of golden sands backed by low cliffs. Nearest village Svoronata. On south coast near airport. Similar to nearby Avithos Beach. Reached by steep steps. Long stretch of sand south of Lixouri. This often overlooked beach offers sand and pebbles and is serviced by a couple of low-key cafes. The beach is located at the base of a steep and winding access road, though the sunsets that can be viewed from here make the effort to get to this beach worthwhile. Petani beach is on the west coast of the Lixouri peninsular. The sandy beach of Katelios. Long sandy beach near to Skala. Small Harbour. Near Katelios beach. 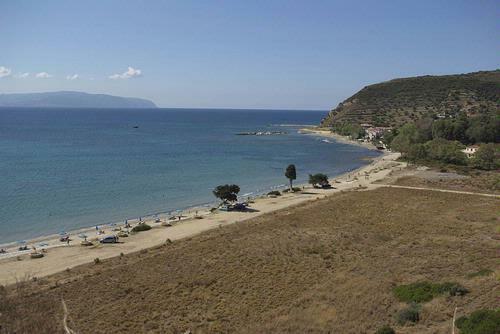 Kaminia is famous as Kefalonia's major turtle nesting Beach. Nearest village Ratzaki. The main beach at Poros. A long beach with shingle and sand. These are the main beaches. There are however, a number of other beaches and sandy bays waiting to be discovered by the venturous traveller which can be reached by car. There area number of coves which are accessible only by boat. Ideal for those wishing for the perfect away from it all beach. For lots more photos of the beaches of Kefalonia, see the photo gallery.